These explanatory notes on foiling are directly applicable to Swarovski products, including the abbreviations used. Generically, foiling is the process of mirror under-coating jewellery stones to increase the crystal or stone's brilliance. This indicates that a specific product has an undercoat of silver mirror that has been coated with Swarovski's exclusive Platinum coloured, protective layer. Since Swarovski introduced the XILION, Swarovski has offered this exclusive Platinum Foiling to help create a brilliance never before achieved and provide an optimal adaptation to varying colors of casings. This indicates that a specific product has an undercoat of aluminium mirror which has been applied using a vacuum coating process. No mirror type coating has been applied to the bottom side of a stone/crystal. Though the notes above apply specifically to Swarovski items, the general idea concerning the foiling process is employed by others and as such, is relevant. Quality of foiling will affect the brilliance of the items. Various manufacturers have differing quality of foiling. 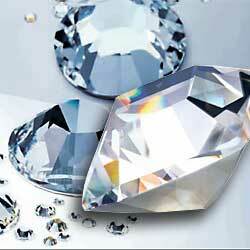 Not unexpectedly, Swarovski foiled items generally can boast of higher quality than most.